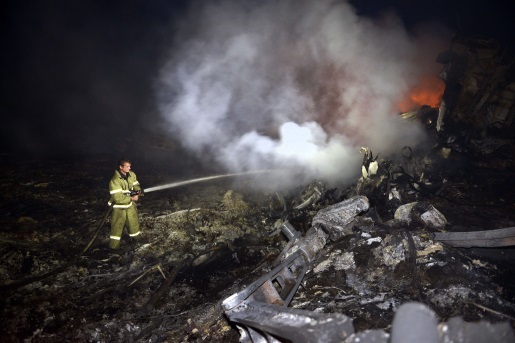 The wreckage of downed Malaysia Airline Flight 17. It seems odd to fly a plane over a war zone, but some 300 flights a day took place over the disputed eastern regions of Ukraine, mostly at heights between 33 and 37,000 feet. That’s high enough to avoid most surface-to-air missiles possessed by the Russia-backed insurgent groups. However, that’s no longer safe, and the airspace above Eastern Ukraine is officially a no-fly zone after a horrible incident involving a commercial airliner. Malaysia Airlines flight 17 was shot down over Donetsk, Ukraine, the center of the Russia/Ukraine shadow war. The flight carried 298 people on board; all are believed lost, though efforts to recover the body have been hampered by rebel activity in the area. Accidents happen, and a Ukranian rebel group briefly claimed credit for shooting down a Ukranian military jet using a high-power Russian-made Buk missile. Russia has been moving heavy artillery and equipment into Ukraine, as well as training pro-Russia separatists in the operation of this equipment. It’s one of the few missile systems that could shoot down something flying as high as the Malaysia Airlines flight was.